A hurricane is brewing in the jungles of the Maya, and the ancient Death Lords are on the warpath. Across the world in Venice, Italy, hanging out with his blogger friend Nasty (Anastasia) Smith-Jones and eating Pizza Gelato, Max Murphy thinks he is safe from their clutches. But when a rogue octopus pulls him off his gondola and tries to drag him down to the underworld, Max realizes that the Death Lords aren't finished with him yet. Soon Max is back in Central America and reunited with the only ones who can help him in his battle--Lola, the mysterious Maya girl, and the howler monkeys Lord 6-Dog and Lady Coco. Once again it's up to the four of them to save the world as they fight off mutant cave spiders, zombie warriors, and, of course, the twelve villainous Death Lords. With the hurricane about to hit land, Max and Lola embark on a one-way journey to danger down the blighted Monkey River. They take shelter in a subterranean hotel, only to stumble upon Death Lord central. Torn between rescuing themselves and rescuing one of the last wild jaguars of the Monkey River region, Max and Lola find themselves drawn into an ever more bizarre series of tests, culminating in a terrifying ballgame that they can never win. 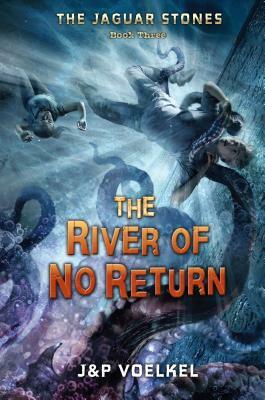 The River of No Return is filled with the same outrageous humor, heart-stopping action, and fascinating details of Maya culture that fans of the Jaguar Stones series have come to love. Readers will be on the edge of their seats as secrets about their favorite characters come to light while Max and Lola try to stop the world from ending . . . at least for now. While Jon Voelkel was growing up in South and Central America, his wife-to-be, Pamela, had an altogether tamer childhood in England. They met while working at an advertising agency in London and now live in Vermont. To research the Jaguar Stones books, the Voelkels and their three children have explored over forty Maya sites in Belize, Guatemala, and Mexico; canoed down underground rivers; tracked howler monkeys in the jungle; and learned to make tortillas on an open fire. Jon s most frightening experience was being lost in a pitch-black labyrinth under a Maya pyramid. Pamela s most frightening experience was being interviewed by Al Roker on the "Today" show. For more information about the authors, the books, the Maya, and school visits, please go to www.jaguarstones.com"